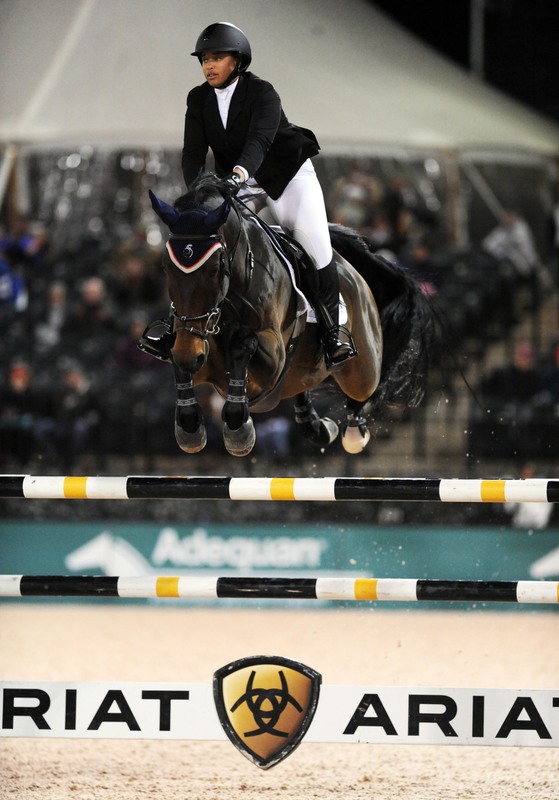 U.S. show jumper Paige Johnson has been suspended for one year following a Fédération Equestre Internationale Tribunal decision on the banned substance pramoxine. Samples taken from Salamander Farm’s Luke Skywalker 46 on Jan. 21 at a CSI** in Wellington, Fla., showed the presence of pramoxine, a local anesthetic. Paige Johnson, pictured on Luke Skywalker 46, has been suspended by the FEI for one year. Photo by Lisa Slade. Johnson had been provisionally suspended from April 5 for three months, so she will not be eligible to compete until April 4, 2018. The Tribunal also imposed a fine of 2,000 Swiss francs (about $2,072) and contribution of 3,000 Swiss francs ($3,108) toward legal costs. Johnson has appealed the decision to the Court of Arbitration for Sport. In the report, Johnson’s groom of 15 years, Sergio Molinero, testified that he bought a triple antibiotic wound cream that caretakers at Johnson’s Salamander Farm had used for years to treat minor wounds and cuts. On a trip to Walmart he bought four tubes of what he thought was the ointment they commonly used, which was known to be safe for FEI competition use. He realized after he had treated a minor cut on Luke Skywalker’s flank before the competition that he bought a version with pain relief that included pramoxine. While Johnson testified to her meticulous barn management and attention to FEI rules at her Salamander Stables in Middleburg, Va., and Wellington, the FEI decision stood due to the presence of the banned substance and because Johnson was the person responsible.